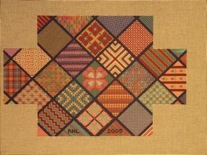 New Jersey Needle Artists Chapter members stitched their choice of two member-designed brick covers during 2005. 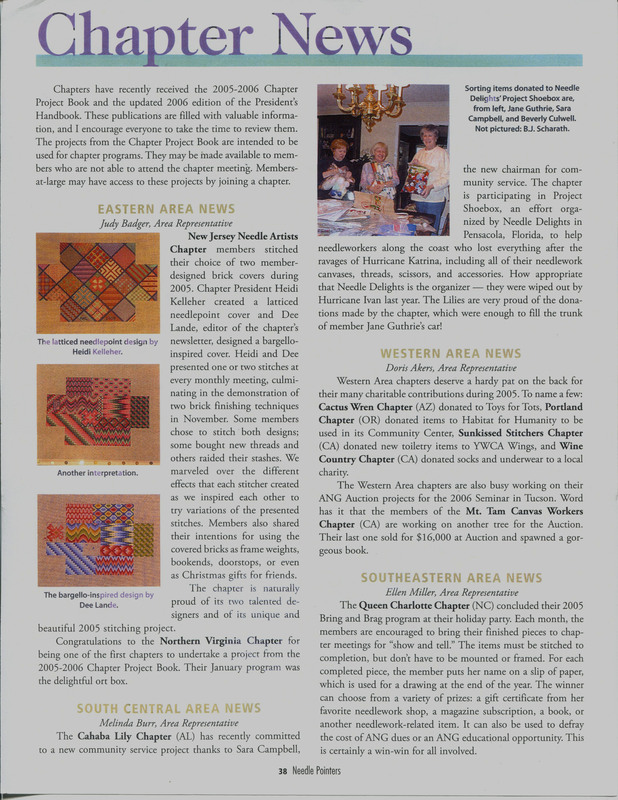 Heidi Kelleher (Chapter President) created a latticed, needlepointed cover and Dee Lande (Editor of the chapter’s newsletter) designed a Bargello-inspired cover. 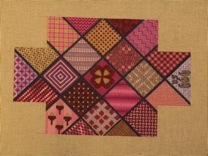 Each presented one or two stitches at every monthly meeting, culminating in the demonstration of two brick finishing techniques in November. Some members chose to stitch both designs; some bought new threads and others raided their stashes. The highlight of each monthly meeting was seeing how other members interpreted the stitches using their choice of colors, threads, and placement. We marveled over the different effects that each stitcher created as we inspired each other to try variations of the presented stitches. Members also shared their intentions for using the covered bricks as frame weights, book ends, door stops, or even as Christmas gifts for friends! The chapter is naturally proud of its two talented designers and of its unique and beautiful 2005 stitching project. Please note that this project was featured in the Chapter News Section of the ANG Needlepointers magazine!